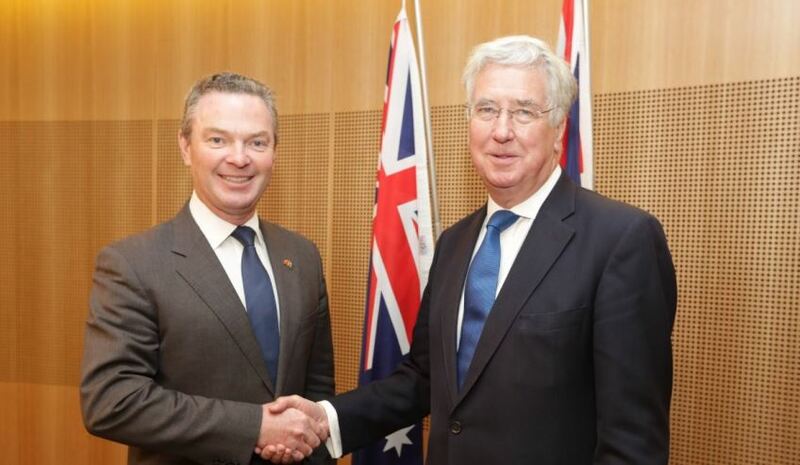 Minister for Defence Industry Christopher Pyne and the UK’s Secretary of State for Defence Sir Michael Fallon have held the first ever Aus-UK Ministerial Defence Industry Dialogue, discussing defence materiel and industry co-operation between the two nations. The ministers agreed to establish an historic and ongoing ministerial defence industry and capability dialogue, supported by a joint senior defence forum to elevate Australian and UK materiel, industry and innovation collaboration. The ministers said Australia and the UK's shared strategic interests, and global threats and challenges reinforce the mutual benefit of closer collaboration and co-operation in these key areas. The two countries large investments in defence innovation was also a strong topic of discussion. "We are both investing record amounts in Defence and in harnessing innovation and science and technology to deliver cutting-edge technology and maintain our capability edge," said Minister Pyne. "Taking our defence materiel and industry partnership to the next level is a natural evolution and one which will deliver benefits for our defence capabilities and defence industries. "Both countries are embarking on major long-term naval shipbuilding endeavours, building our sovereign defence industrial bases, and seeking to pull through defence innovation into practical defence capability." Sir Michael, who is in Australia a part of Australia-United Kingdom Ministerial Consultations (AUKMIN) 2017, said that both nations are seeking to enhance defence exports in order to support stronger and more resilient industrial base. "From the historic Battle of Passchendaele to modern challenges like Daesh, the UK and Australia have a close history of collaboration. Through our £178 billion equipment plan we, like the Australians, are investing in state-of-the-art kit for our armed forces as we continue to lead in tackling the threats of the future. The strong relationship between our two countries is growing stronger still through our increased defence co-operation and our dialogue this week," he said. "As word leaders in the defence industry, with shared interests like P-8 maritime patrol aircraft and F-35 fighter jet capability, we are stepping up our defence industry collaboration and enhancing these relationships to the benefit of both our great countries." The ministers agreed today’s meeting was an important step in elevating the Australia-UK defence industry and capability partnership for enduring success and will support regular ministerial engagement, including with the UK's Minister for Defence Procurement Harriett Baldwin. This regular engagement will continue in the coming months as Minister Pyne will travel to the UK in October and will meet with counterparts such as Minister Baldwin, and Secretary of State of International Trade Liam Fox. Minister Pyne will have a further dialogue with Minister Baldwin, who will be visiting Australia later this year, and today’s meeting will be a precursor to those discussions.